In the tropical rainforest of Borneo, Indonesia, there is a very unique school with some very special students. 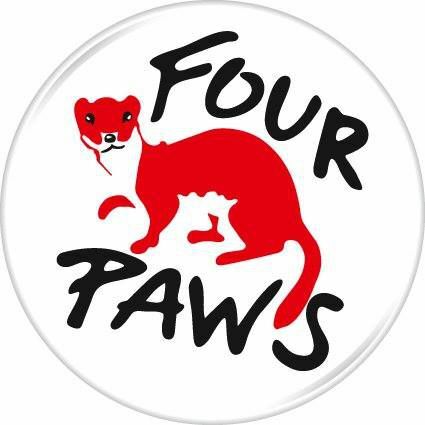 Called the Four Paws Orangutan Forest School, it is a collaboration between the animal welfare nonprofit Four Paws and the Indonesian government. 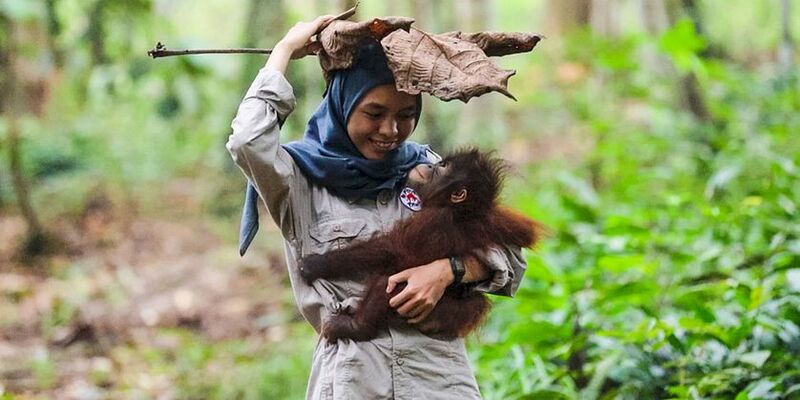 The school is run by world-renowned primatologist Dr. Signe Preuschoft, who works alongside biologists, veterinarians, and caretakers as they rehabilitate rescued baby orangutans. All of the darling babies who reside at the forest school are orphans — saved and rescued from the most dire of circumstances. Their parents have tragically fallen victim to human-wildlife conflicts, which are becoming much too common throughout Indonesia. 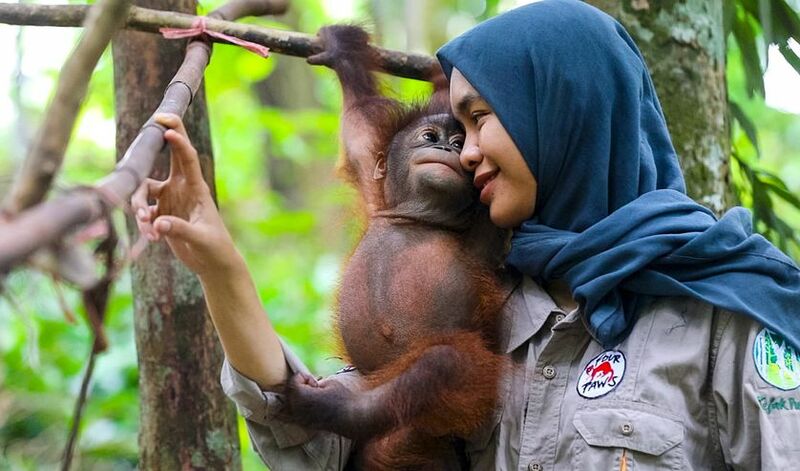 Some of the biggest threats that wild orangutans face as they struggle for survival are human over-development, rampant deforestation, palm oil plantations, and the illegal pet trade. “Orangutans are suffering from the destruction of their homelands, especially since open-pit coal mining is a huge problem here. 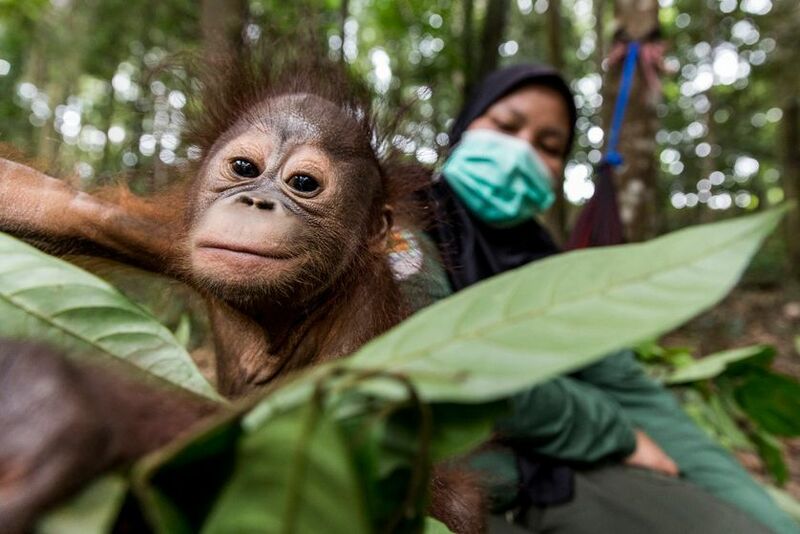 As humans advance and encroach, orangutans either starve or get hunted dow,” said Dr. Signe Preuschoft, who runs the Four Paws orphanage. When rescued, young orangutans usually need around-the-clock care since many of them are injured, dehydrated, and close to starvation. 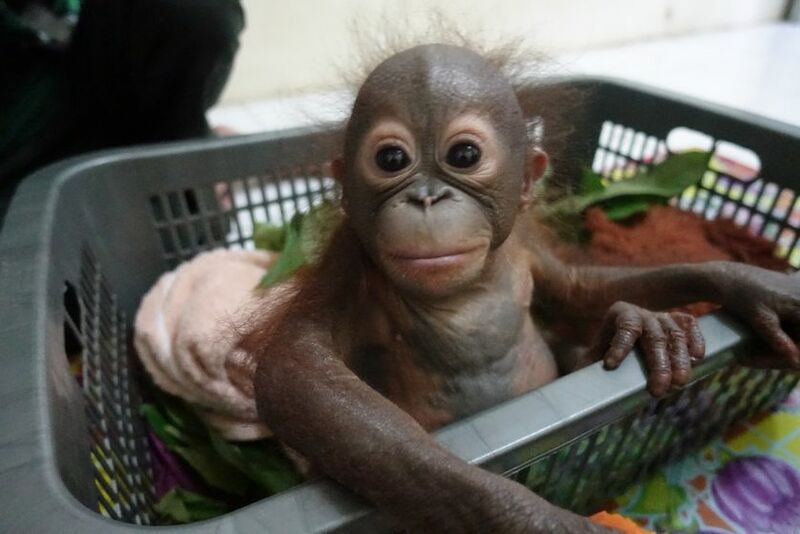 During this critical first stage, they reside in the orangutan infant house where they are provided not only medical care, but also much-needed affection and comfort from devoted human caretakers. When the babies no longer require 24-hour medical treatment, they can move on to the forest school. The little cuties who attend Four Paws forest school are very lucky, as they are in good hands being cared for by their attentive surrogate moms. 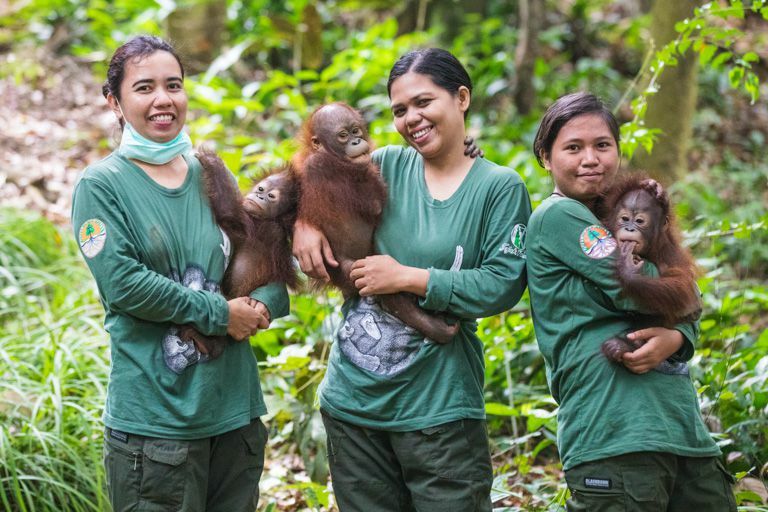 And although spending all day playing with adorable baby orangutans sounds like a dream job, these surrogate moms have very important work to do. They have to make sure that the little ones learn crucial skills that will be necessary for their survival in the wild rainforest. Everyday life skills such as learning which fruits and leaves are safe to eat, building sleeping nests, or avoiding snakes are all essential skills to learn before the orangutans can be released back to the wild. These lovable youngsters spend most of their time at the forest school playing, climbing, trying out all kinds of acrobatic exercises, and testing their stability on branches and vines. 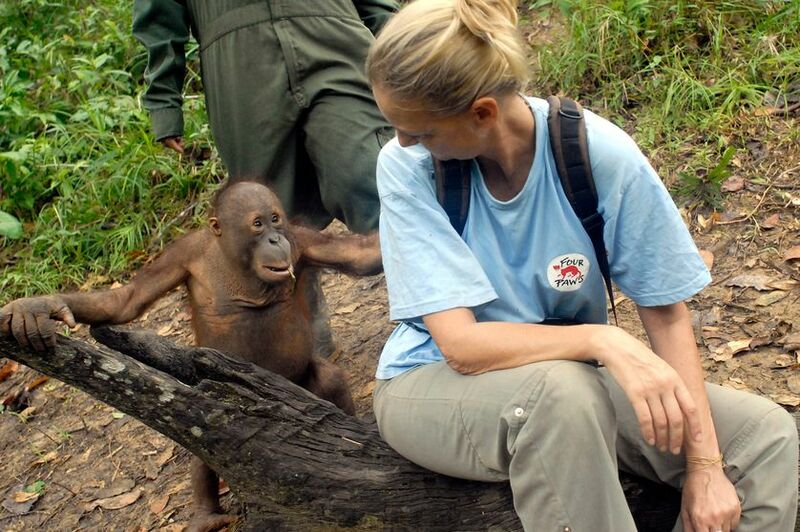 The orangutans learn a great deal from observing their caretakers and each other. They experiment with different foods, how high they are able to climb, and how far they can swing and jump. Every day they gain more and more confidence as they get bigger and stronger, and increasingly more independent. “It is similar to raising a child and then releasing them from the family home to attend university — one is proud, but also worried whether they are resilient enough, and whether they have good judgement to abstain from dangers and seek what is good for them." These baby orangutans still have awhile to go before making their way back to the wild rainforest, and still so much more to learn at the forest school. They survived the trauma of losing their mothers and overcame a great deal in their young lives. Now with the dedicated Four Paws team by their side, everything will be onwards and upwards from here.